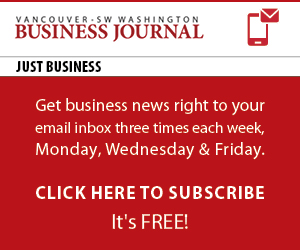 Home Special Editions Business Forecast What’s ahead for Southwest Washington in 2014? What’s ahead for Southwest Washington in 2014? At the Port of Camas/Washougal, executive director David Ripp is excited about the completion of Phase 1 (infrastructure) of the Steigerwald Commerce Center. He said that this summer the port started construction of a 22,000-square-foot facility for Foods in Season, and they’re already asking to add another 5,000 square feet. Additional positive input came from Marty Snell, Clark County Community Development Director. Snell said that new residential construction and commercial valuation numbers in 2013 were higher than in 2008 when the “economy tanked.” In anticipation of this trend continuing in 2014, he has requested budget to hire nine new staff. This will bring the department staff to 19, up from a low of 9 in 2009. Snell bases his forecast on leading indicators, such as the number of single-family permits issued, lot inventory, pre-application conferences and post-decision review requests. He stated that since 2002, the adjusted commercial valuation value averaged $92 million/year; through October 2013, that figure was $102 million. Responding to the improved development climate, the department is remodeling its permit center starting this month, scheduled to reopen in mid-March. Snell also reported continued improvement in application-to-notification time. There are some challenges ahead for Clark County, however. Ripp said that stormwater regulation is a potential problem. “Ecology is putting too many barriers up for development. We totally support the environment, but there has to be a happy medium so that you can create jobs,” explained Ripp. Bomar added that last year’s loss of the Public Works Trust Fund, which provided low-cost no-interest loans for infrastructure investments, nearly doubles the cost of infrastructure. “We’ll be looking at ways to get that back quickly, or other ways we can be more efficient in funding infrastructure,” said Bomar. Clark County’s neighbor to the north is also anticipating economic growth in 2014. Mike Karnofski, Cowlitz County commissioner and board member for the Cowlitz Economic Development Council (CEDC), said that one of the key economic drivers for Cowlitz County is exports. The dredging of the Columbia River allows grain ships to carry 10 to 15 percent more grain. In response, grain facilities are expanding. The recently completed EGT grain facility in Longview (the largest in the Northwest), is one example. Now, the county’s biggest project is the $100 million Tempco Grain Elevator expansion. • Lengthening the Southwest Washington Regional Airport runway to accommodate smaller commercial jets. • Kicking off the 432/433 Corridor Project that will connect I-5, highway 432 (Industrial Way) and highway 433 (the Longview/Rainier bridge). This is a $100 to $200 million project involving the cities of Longview and Kelso, WA DOT, the Port of Longview, CEDC and the Cowlitz/Wahkiakum Council of Governments. Karnofski said they currently were working with $4 million in state and federal grants to develop a project plan. • Developing a business incubator at the Port of Woodland. Building on existing businesses at the port, such as fishing supply vendors, Karnofski said the port was looking at developing a business incubator around the outdoor industry. “Woodland is the fastest growing area of Cowlitz County,” said Karnofski. He said that over the next two to three years, the town would be building a new police station, library, swimming pool and high school. • Expanding the Port of Kalama. The port has purchased property west of Exit 32, with plans to create a commercial and light industrial area. The city of Kalama has agreed to annex the property and provide sewer and water. “This project will really expand the span of the Port of Kalama,” said Karnofski. A recent planning grant from the Mid-Columbia Economic Development District will help Skamania County attract value-added food manufacturing companies to the area. Robert Waymire, executive director for the Skamania County Economic Development Council (SCECD) said these companies could include breweries and firms that transform fruit into fruit bars. Already, the county is home to several breweries such as Backwoods Brewing and Walking Man Brewery. Soon, he said, Skunk Brothers Distilling will call Stevenson home. The value-added food industry will help Skamania County diversify beyond their largest industry – tourism. A positive sign, Waymire said, is that the SCECD’s expansion and micro loan programs have been “really busy” for the last 18 months. But, the expansion loans are funded by the federal government, as a result of the Columbia Gorge Scenic Area act 25 years ago. The county has received $4 million of the promised $5 million, and has precious little left to loan. Other challenges also exist for the county. Insitu is relocating their office to Bingen, leaving the Tichenor Building on the waterfront vacant. With 92 percent of the county’s property being owned by the federal or state government, the county has a very low tax base. “The few properties we do have are very important,” said Waymire. “Trying to fill that space will be crucial,” said Waymire. Also, last June the Bridge of Gods was reduced from an 80,000-pound to only 16,000-pound weight limit. This eliminates virtually all truck traffic, and has negatively affected the county’s ability to attract new businesses. Waymire said the county is hoping the bridge’s 80,000-pound limit will be reinstated by the end of January. Bomar said that Southwest Washington is poised to experience a lot of positive economic development – the key is how we brand ourselves and market ourselves. “Leaders and public officials need to think about how they speak about our community,” enjoined Bomar. Across the region, he added, the philosophy is that partnerships create the best efficiencies. Waymire added that we should continue to educate businesses and students and foster relationships with developers, schools, the Forest Service and other regional agencies working on economic development. According to Scott Bailey, regional economist with the Washington Employment Security Department, experts expect the national GDP to grow faster in 2014 than in 2013. But does that mean employment will grow faster? But, he countered, Clark County had 2.7-percent job growth this year, with construction being the fastest growing segment. 2013 saw 3,500 jobs added in Clark County – 800 in construction, 500 in manufacturing, 600 in retail, a “couple hundred” in finance, 200 in professional services and 400 in leisure/hospitality. Bailey cautioned that Clark County lost a lot of middle-wage jobs in the recession, and what’s come back in the last two years continues that pattern. He said that out of about 3,400 FTE positions added in 2011-2012, 1,000 were below $12/hour and just under a 1,000 were only $12-26/hour. He hopes that the completion of the Fisher Investments office building in the spring of 2014 may help create some higher paying jobs.